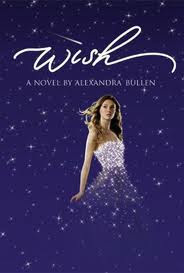 Wish was written by Alexandra Bullen. Nothing can change the fact that Olivia Larsen's twin sister, Violet, is gone . . . until a mysterious, beautiful gown arrives on her doorstep. The dress doesn't just look magical; it has the power to grant her one wish, and the only thing Olivia wants is her sister back. With Violet again by her side, both girls get a second chance at life, and they soon discover two more dresses, and two more wishes.